Currently UnbridledRider enables you to choose as goals any of three focus areas – Dressage, Hunter Jumper and/or Ground Manners. We intend to add other focus areas (such as Eventing and Reining) over time. If you’re interested in having us add a particular focus area, tell us by clicking on the feedback button to the right of the screen. 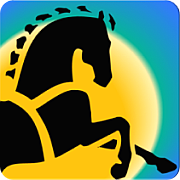 Since mastery in the equestrian world is a combination of rider mastery and horse mastery, the site is set up so that you can set goals, assess mastery, find helpful actions and resources and track progress for yourself and your horse as a horse/rider pair. If you work with multiple horses, add each horse to your My Horses section so that you can build and work development plans for each. If you don’t own a horse but would like to track your own mastery, enter a horse that you typically ride (or a horse of your dreams) into My Horses and launch goals, assess mastery, find exercises and track progress relative to your ability to ride/handle that particular horse. As we equestrians love to “Talk Horses” with our other horse friends, we’ve set up a social networking section that enables you and your horse friends to do just that. The settings are automatically set to Private (Only I can see My Pictures, Videos and Information), thus to share any of your content with others, you will have to proactively change your Privacy Settings to Share with My Friends, Other Unbridled Rider Site Members or the World. You don’t have to sign up to UnbridledRider.com to find the site useful. Without signing up you can see the Featured Experts, read the Barn Stories, look at the Great Videos and take advantage of the Master Movements application at Intro Level Dressage, Intro Level Hunter Jumper and Ground Manners 101. The real power of the site though is its offering of a free place to bring together a comprehensive view of your horse and rider journey, to help you to master movements, to track progress over time and to share your journey with friends. You can do this easily by creating an identity on the UnbridledRider.com by signing up. We’re very excited to be on this horse & rider journey together and would love your feedback. Please use the Feedback button at the right of the menu to let us know your thoughts.